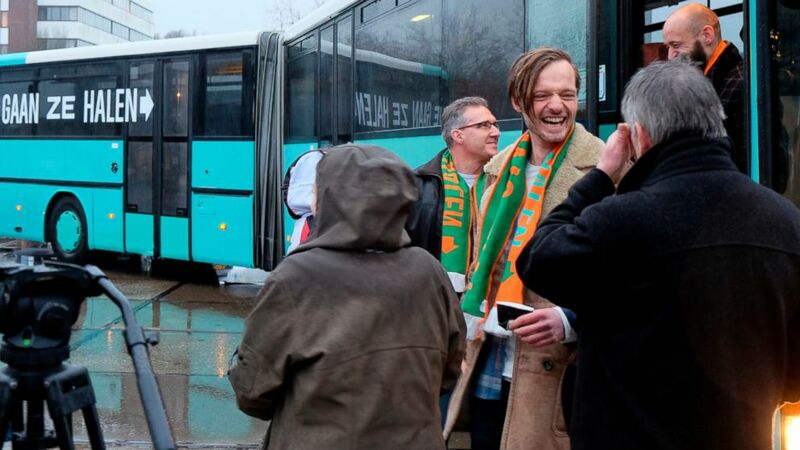 A bus and a fleet of cars have set off from the Netherlands in a continent-crossing convoy to raise awareness of the plight of migrants languishing in overcrowded Greek island camps and maybe even bring some of them back to the Netherlands. Organizers, who say they have written to Greek Prime Minister Alexis Tsipras asking him to help, concede their chances of success are slim. They won't bring back any migrants unless Greek authorities let them. "It's Christmas, so let's believe in miracles," said Rikko Voorberg, who helped organize the convoy. The group suffered an early setback when the bus broke down not long after setting off. The organization tweeted that it was driving to a garage for repairs before continuing its journey. According to the Greek government, more than 14,500 migrants are stuck on islands in the eastern Aegean Sea, where official camps and other accommodations have room for under 9,000. Conditions at the camps have been heavily criticized by aid groups. The Dutch government says it has contributed to an EU program of relocating migrants from Greece and Italy and is warning that any attempt to bring some of them to the Netherlands could be seen as people smuggling. "Illegal transport of people without a right of residence would amount to smuggling and is punishable," Migration Minister Mark Harbers told The Associated Press. "Not only in the Netherlands, but also in the countries" the group has to drive through. Voorberg stressed that his group isn't planning to smuggle anybody and will only bring back migrants if they are granted papers by Greece. About 25 cars and the bus left the central Dutch city of Utrecht on Friday, hoping to arrive in Athens by Dec. 24. The action is the latest example of Dutch citizens coming to the aid of migrants. At home, a rotating cast of visiting ministers has been running a non-stop church service since Oct. 26 at a small church in The Hague to prevent the deportation of an Armenian family of five whose asylum application has been rejected. Under Dutch law, officials can't enter a church while a service is underway. The three children of the Tamrazyan family don't qualify for the amnesty policy aimed at allowing children who have grown up and laid down roots in the Netherlands to stay even if their asylum applications are rejected. "This is our home. This is where we belong," Hayarpi Tamrazyan, who is now 21, said during a recent visit by media to the Bethel Church. "My brother, my sister and I grew up in the Netherlands and we have been living here for almost nine years." The church said Friday that the migration minister has refused to use his discretionary powers to let the family stay, and vowed to continue the service. Children in similar circumstance have plenty of support in the Netherlands, which was once known as a welcome haven for asylum-seekers. A Dutch television presenter, Tim Hofman, recently gave lawmakers an online petition calling for a more generous children's amnesty that was digitally signed by 250,000 people. The Dutch branch of the Defense For Children charity says there are about 400 migrant children in a similar position to Tamrazyan and her sister and brother. The government introduced an amnesty rule in 2013, which under special circumstances grants asylum to children who have been in the country for more than five years while their asylum application is processed. Martine Goeman of Defense for Children says appeals for such a pardon are rarely honored. The migration minister says Hofman's petition won't change the policies of the ruling four-party coalition, which decided when it took office late last year not to broaden the amnesty. Harbers' ministry said in a statement that softening the Dutch government's stance runs the risk of attracting more migrant families "who try to extend their stay long enough to qualify for a children's amnesty."